Mario Ortiz-Robles. Literature and Animal Studies. Routledge, 2016. Why do animals talk in literature? 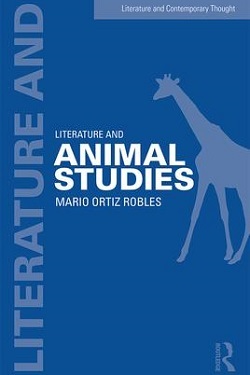 In this provocative book, Mario Ortiz Robles tracks the presence of animals across an expansive literary archive to argue that literature cannot be understood as a human endeavor apart from its capacity to represent animals. Focusing on the literary representation of familiar animals, including horses, dogs, cats, and songbirds, Ortiz Robles examines the various tropes literature has historically employed to give meaning to our fraught relations with other animals. Beyond allowing us to imagine the lives of non-humans, literature can make a lasting contribution to Animal Studies, an emerging discipline within the humanities, by showing us that there is something fictional about our relation to animals. Literature and Animal Studies combines a broad mapping of literary animals with detailed readings of key animal texts to offer a new way of organizing literary history that emphasizes genera over genres and a new way of classifying animals that is premised on tropes rather than taxa. The book makes us see animals and our relation to them with fresh eyes and, in doing so, prompts us to review the role of literature in a culture that considers it an endangered art form.